The restaurant, seating just 40, is in a former carpentry workshop, with exposed brick work and steel girders, with furnishings made from re-cycled timber. 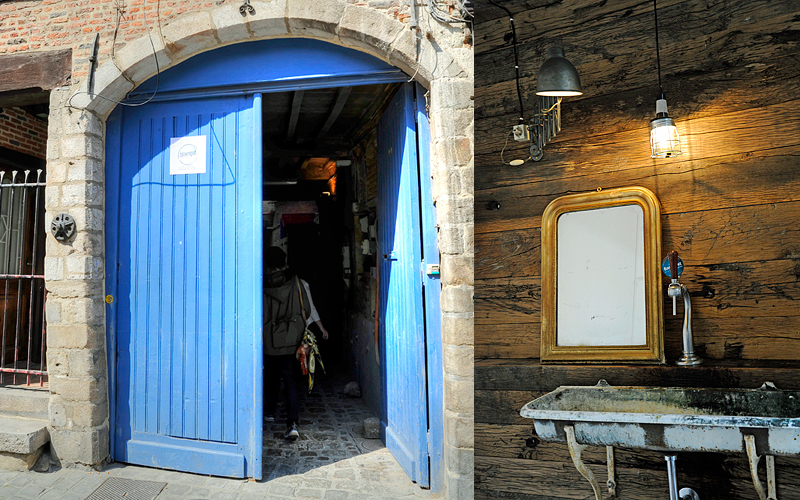 It has a rustic almost industrial feel with a quirkiness that I loved. Being tucked away behind two large blue wooden gates on ‘Butchers’ street you could easily walk straight passed without realising it is there. As you enter you feel as if you are in-the-know on a well-kept secret, something special, although with tables booked up months in advance it’s not a very well-kept secret! I’m told that if you arrive early for lunch, there are usually a couple of tables reserved for anyone who happens to turn up on the day. The menu is centred around simple, fresh, local produce but at lunch time at least there is no choice – simply one starter, one main course and one dessert. When I visited last month I found the scallops and aspargus starter good, if a little small with just one scallop. The veal and fennel main course was perfect and came with some very moorish potatoes but, while my companions enjoyed the dessert, I found it rather disappointing, a bit of a non-event. And the restaurants name? That means flowerpot in Flemish. Closed all day on Sunday and Monday and Tuesday evenings. 19.50€ : starter and main or main and dessert, both with a drink. 25€ : starter, main and dessert with a drink. Online bookings can be made on their website, Bloempot.fr. Gorgeous, I love restaurants like this, would love to go there some day. The presentations are stunning! And Lille is a lovely historic town that I’m sure you would enjoy. Even before I read your review, Kathryn, I was very taken with the look of the place. So your words confirmed that I would also love the décor and atmosphere. The food looks good, what dessert was it that you had that was a non-event? It was a green apple and lemon mousse with crumbled biscuit. It was fine but I enjoyed the other two courses so much that it just left me rather… underwhelmed! I certainly love the design of this restaurant and the town sounds lovely. It would make me a little nervous to try a lunch spot that only had one choice on the menu, but simple, fresh and local is usually a winner in my book. This looks like a really high quality restaurant and one that would be great to experience for an evening meal. Sorry to hear your dessert experience wasn’t the best though how you describe the apple/lemon mousse with biscuit actually sounds pretty good to me! That’s the problem with desserts in general though because by the time they come around you have either been astounded by the quality of the main course and starter, or you have already eaten enough that you just don’t have the appetite for anything else. I particularly like restaurants that have wine bottles stacked in cabinets or on display as part of their decor. It reminds me of Mandalay Bay in Vegas where they have stacks of vintage wine bottles on display, they really are a nice touch to set the mood!